NE GLANCE at the way Michael Herbert uses his hands will tell you how he earned his nick-name The Magician . His accurate and characterful silhouettes are cut in a matter of seconds with a long pair of surgical scissors. Born in New Zealand, in 1962, Michael is a talented magician. 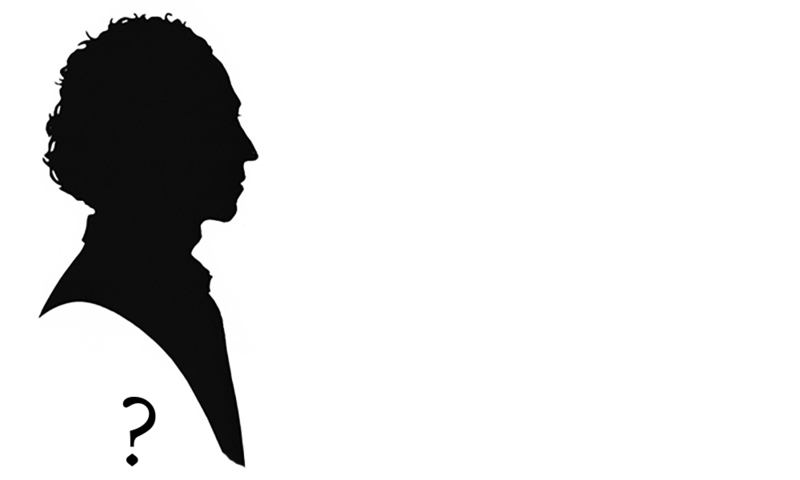 Dissatisfied with conjuring tricks, he abandoned the pursuit of magic to take up a career as a silhouettist. He taught himself to cut silhouettes in the late 1990’s after studying the work of the famous American magician/silhouettist Dai Vernon. Michael’s professional background is in architecture. This left him with a unique sense of proportion, linear style, and the all-important spatial aptitude needed for silhouette cutting. He teamed up with Charles after calling him out of the blue one day, to ask what kind of paper he should use to cut silhouettes. They have been firm friends ever since. Together with Charles, Michael Herbert was booked for the Queen’s 80th birthday party in 2006. Michael is available for mix-and-mingle silhouette cutting at corporate and private events. He also offers silhouette workshops in schools and museums. “I have been cutting silhouettes professionally for over ten years. I work at a wide range of events, both at home and abroad. My architectural background helps to give a sense of proportion and detail to my work. Initially I was intrigued by the look that a child has in its eyes when spellbound, a phenomenon which disappears as we get older. I spent years trying to find a way of re-creating that ‘look’ in adults. Initially I experimented with sleight-of-hand magic, but eventually I settled on cutting silhouettes. I am currently researching the possibility of capturing the actual character of the person in these minimal portraits (rather than simply a physical likeness) a feat which many believe to be impossible. I have given a number of workshops for schools and museums, which involve a brief talk on the history of the silhouette and a demonstration of ‘how to do it’. This is followed by pupils attempting to cut a likeness of their friends! These are mounted on a printed handout which summarises what they have learned. This is an area of work I am keen to expand”. When working at weddings Michael works slightly differently from Charles. 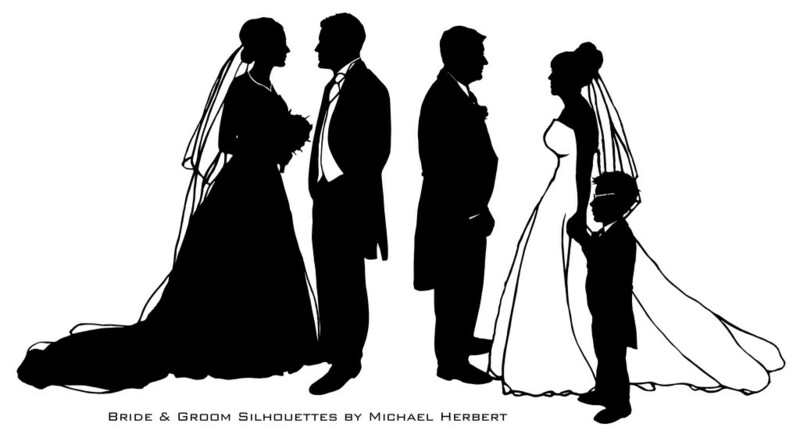 If the bride and groom would like a full-length silhouette he will take a couple of photographs on the day and cut them afterwards in his studio. He finds this way of working produces better results, allowing him more time to cut white veils, collars and dresses into the black paper. One glance at the examples below shows this is time well spent. Two sets of bride and groom full-length profiles. 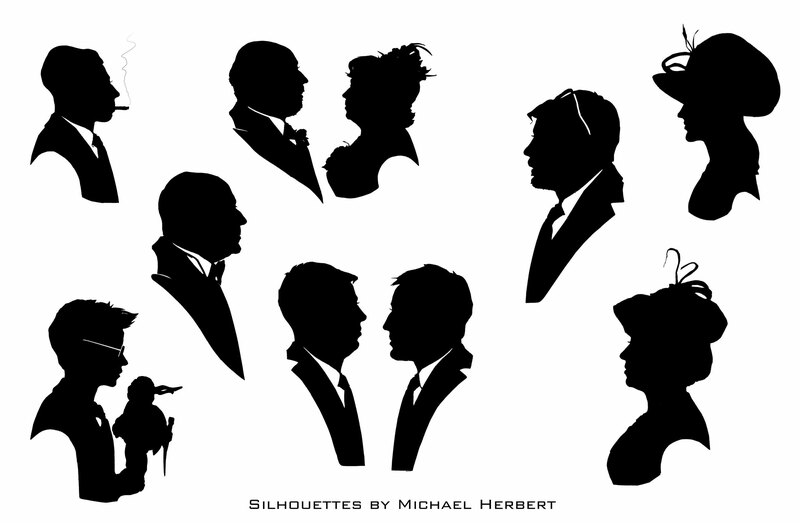 These are studio silhouettes cut after the event by Michael Herbert.